The weekend has been about me undoing work I have done up till now. OK, that sounds a little odd but I makes sense, my head says I needed to do it, but my heart said no. After speaking to Adam at Mustang Maniac I asked the questions “does my wire loom need to come out?” The reply was simple – “is the cowl OK?” I know there was a little issue of rust around it but it looked OK, in my eagerness to get the car wired I done the best patch up I could, deep down there could be issues. So the decision was made to take the whole loom out again so we don’t damage the loom and check the cowl out properly. If you have a dodgy cowl the rain could get in, run down some rust and ruin the carpets. Potentially every time I clean the car I would ruin a carpet, let alone being caught in the rain or use the window washers come to that. Also the dash has got to have a repair plate welded back in to look original instead of the wide gaping hole there at the moment where a modern radio was put in, ideally the area behind it needs to be clear of wires. Once the car gets down to Mustang Maniac we are going to look at sorting out the cowl, rear quarters, any chassis welding work etc. then to paint the car properly. For that it will need it to be a shell in order to make it easier for the paint and prep work. You may ask yourself why did I do all the work I have so far? The answer is simple but the answer is threefold. The first is when I got the car there was nothing in it to work, so I wanted to know it was going to work, so I wired it up to prove that it does basically work mechanically. Secondly I didn’t know the Mustang Maniac guys at the time and I was (mis)led and “advised” by other people, – it turns out they obviously don’t know as much as they think they do, those people and companies shall remain anonymous from me as they don’t deserve any mention on my blog, at all. I could name and shame but then I will be bouncing their name possibly advertising them, but they know who they are! Thirdly, it’s a learning curve, I was going to do what I had to do to get the car on the road. Many conversations with Adam made me realise that it’s a bit of a false economy and I should do it properly. yes, it will take longer, but on the other hand, it will be more reliable and last longer, it will look so much better and be worth much more, in fact should outlive me! The car was bought for me as a hobby to do up over time, which I am enjoying every minute of it, even when the car bites back and draws blood from me. 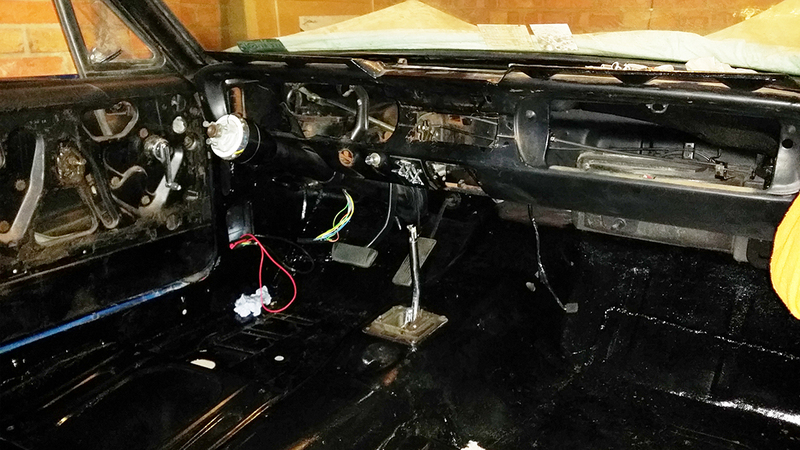 In my infancy of car restoration things were done a little bit back to front in retrospect. BUT, the huge advantage is what I have done so far, I know fits and works. The last thing I wanted to do was have a nice paint job and go messing it up by doing stuff I wasn’t to sure about, scratching it, denting it and so on. One of those major things was wiring the car up from nothing, turn the key and it starts. That proved the point that the engine was basically OK and proved to myself that I can wire a car up. Other things like the brakes needed to be sorted out too. I know that I had of had the car sprayed and put the brakes on the car as I first did I would have ruined the under hood paint. The original brake booster looked fine, I checked it and cleaned it up, and when I filled it up with fluid it was fine, but when the pedal was pressed it squirted brake fluid out all over the place, like a kids water pistol in fact. Without a question of doubt it would have ruined the paint and I would have been gutted more than taking the loom out again. The brake booster and dual cylinder upgrade on there now works and should be a simple bolt back in job. So you see it’s not such a bad idea after all. Yes I took two steps forward, the one step back should only be a temporary loose of momentum though. In fact there are things I will do little differently when I put the wiring back in again. So it’s not so bad in the end after all. The inside is just as bad! The American AutoWire loom was on its way out, and it all looks like a mess again. The advantage that I cling onto is that I can wrap all the wires back up again with insulation tape once in place. The engine will be coming out, so will the gear box, drive shaft etc etc. in order to spray the engine bay properly. 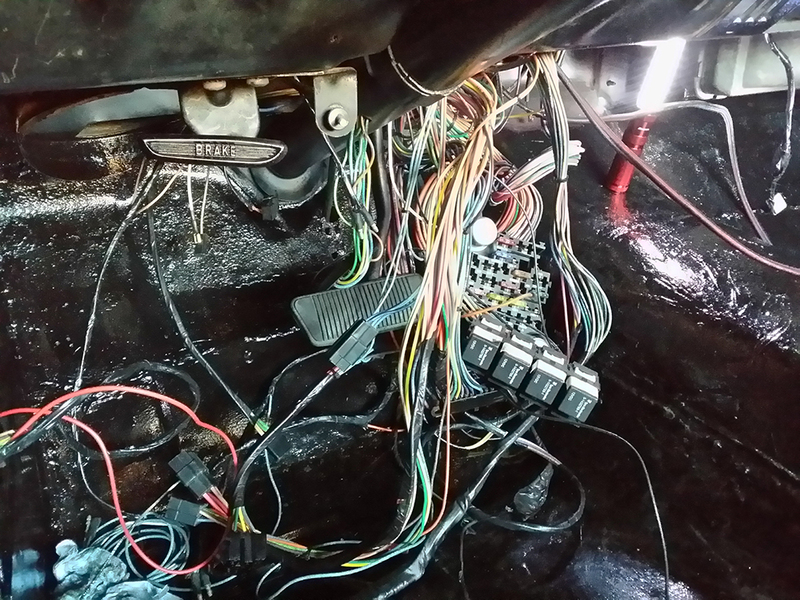 Inside the car with the main loom out, only the heater control loom and the rear link loom is still in place. The car is almost back to how it was when I got it! In a way I’m a little sad, but on the other hand it will be a better job than before. (I must keep telling myself this to keep the spirits up). Short-term I will not hear that bark of my v8 again for a little while anyway. As it’s winter and it can be cold the good lady wife took pity on me and bought me a heater for the shed or garage while I am working out there on my beloved Mustang. The only thing is wanted something that was in keeping with what I had, retro in other words. There are these horrible plastic boxes out there that do the job, but I just don’t like them. I mentioned that I liked a particular style made by Honeywell and I was lucky enough to get it. Women have this knack to store things in their heads for ages, in this case it worked for me. Most of the time it’s evidence used against me when I am after something. Know what I mean guys? 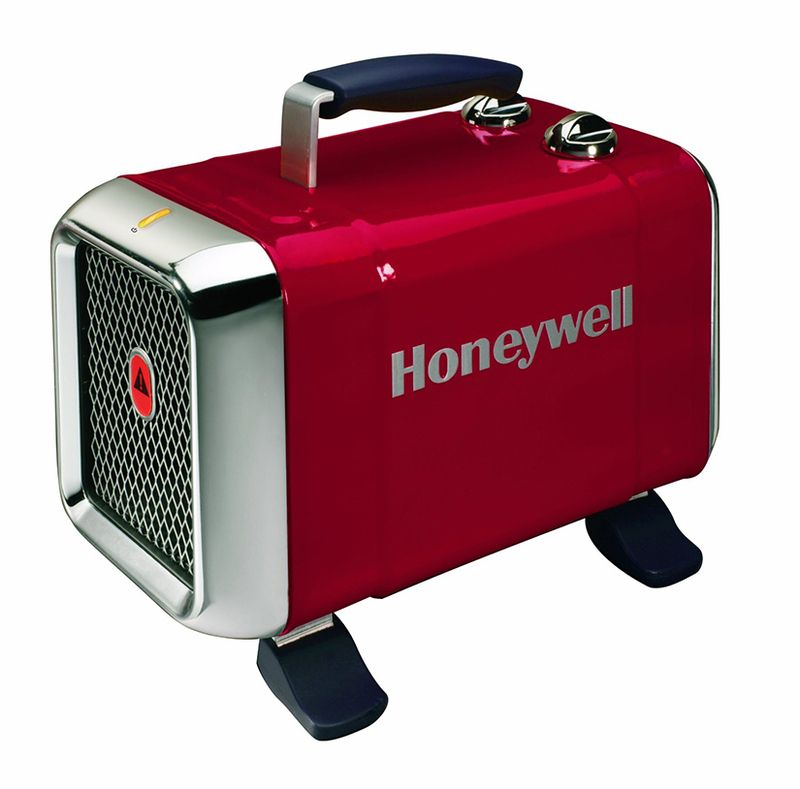 I have reviewed the Honeywell Heater HZ-510E1 under Accessories Reviews. Is it as good as it looks? This entry was posted in Car, Reviews and tagged American Autowire, heater, Honeywell, Honeywell Heater HZ-510E1, HZ-510E1, Mustang, Mustang Maniac, paint job, restoration, retro, spray job, wiring loom. Bookmark the permalink. I will keep it up I need to drive it, the desire to drive it burns my soul. Patience is the key I believe. My guess is now confirmed. Remember our last week’s talk about “your kid” what I said…? I must say I admire your wife. Hat down! Great couple! Yeah she’s a great woman and we work well together. It was bought for me to occupy me as a hobby. It’s a long story I won’t tell on here but I might be persuaded to tell it to you via email, one day if you can handle it. Lol. Amen to that. Your right cutting corners and you know deep down you have done this or that and never be happy with it. Thats why I have gone back to wires, the wire wrap started to fray so I want some decent stuff, so its sort of done me a favour. But its bare and empty and it just makes me feel a little down, hindsight is a wonderful thing. I also took out the wiper motor witch is a complete pig of a job, mirror in a tiny space etc. The retaining spring pinged of and I cant find it. How annoyed was I?? Dont even ask! These things are sent to try us! As you say though, they are all learning experience and if there is no hurry to get the vehicle on the road then it makes sense to revisit it and get it done properly. Agreed on women, they have memories like Elephants or maybe Sharks? My wife can remember word for word what I said in an argument 10 years ago when I can’t even remember what I said a week ago…. Loved the heater review. I have a gas fired heater, a little devil from Machine Mart. It is not so good as it requires so much ventillation during use that it negates the heat given out. In my case if I close the workshop doors and seal the gaps the heater warms the workshop up to a barmy temperature but then I die off of fumes. If I leave the doors open to give the required ventillation I gain no benefit from running the heater as I have to work in freezing draughts. I think your electric one works better in that respect as you can run it without needing ventillation. My friend we are on the same wave length. I can’t remember yesterday but things said when we first meet are often resurfaced. Lol. Yeah theres no rush for the car to be on the road but I would like to take it to a classic car show this year as its the 50th anniversary. But if I have to wait then I wait. Glad you like the review, the heater is not bad at all and does have an advantage of no ventilation as you say, but I expect it will take longer than your heater to get the room hot. I find a 500w lamp also keeps the heat goin as I have it looking into the engine of my car in the garage! LOL, I’d like to get my Land Rover completed by April, not just in time for my birthday but also for the start of the show season. However as it has taken 4 years so far to rebuild it what is another year to get the job done properly? I’ve also had to revisit certain areas that I thought I’d finished and crossed off my ‘to do’ list. Also I’ve spent time and money on things that many would consider trivial and less urgent than getting the engine running etc but as I’m building what is effectively my dream Land Rover I figure that I may as well take the time and spend the money on these things as I may not get another chance. Also what is the point in starting to build your dream vehicle if half way through you start cutting corners and compromising just to get it finished sooner?